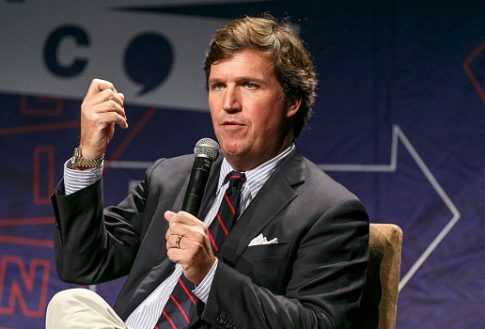 A left-wing group posted videos of a mob gathered outside the home of Fox News host Tucker Carlson on Wednesday evening. The videos, released by a self-described Antifa group, showed people shouting, "Tucker Carlson, we will fight. We know where you sleep at night." Now removed, the video was posted on social media by Smash Racism D.C., Fox News reports. The group claimed Carlson spreads "fear into our homes," prompting the mob to get even with him. "Each night you remind us that we are not safe. Tonight, we remind you that you are not safe either," the group posted. They also chanted, "Racist shitbag, leave town." Carlson was at the Fox News office in Washington, D.C. when the mob arrived, but his wife was there and called the police before locking herself in a pantry. Carlson's wife, Susie, did not let him know about the mob so he would not be distracted before starting his show, Carlson said. The host said the Antifa group rang his doorbell, broke his door, and one person appeared to mention a pipe bomb on a security video. The mob eventually dispersed. Carlson said the group posted the home addresses of Daily Caller co-founder Neil Patel and his brother online. "Here’s the problem, I have four children," Carlson said about the mob incident. "I never thought twice about leaving them home alone, but this is the reaction because this group doesn’t like my TV show." Smash Racism D.C.'s Twitter account was suspended on Thursday. In September, Smash Racism D.C. tweeted out a video of protesters confronting Sen. Ted Cruz (R., Texas) at a restaurant with chants of "we believe survivors." In June, Rep. Maxine Waters (D., Calif.) encouraged people to harass officials in the Trump administration, telling supporters at a rally, "get out and you create a crowd, and you push back on them, and you tell them they’re not welcome anymore, anywhere." Last month, twice-failed presidential candidate Hillary Clinton said "civility [could] start again" if the Democrats were to win back Congress. This entry was posted in Politics and tagged Hillary Clinton, Maxine Waters, Tucker Carlson. Bookmark the permalink.